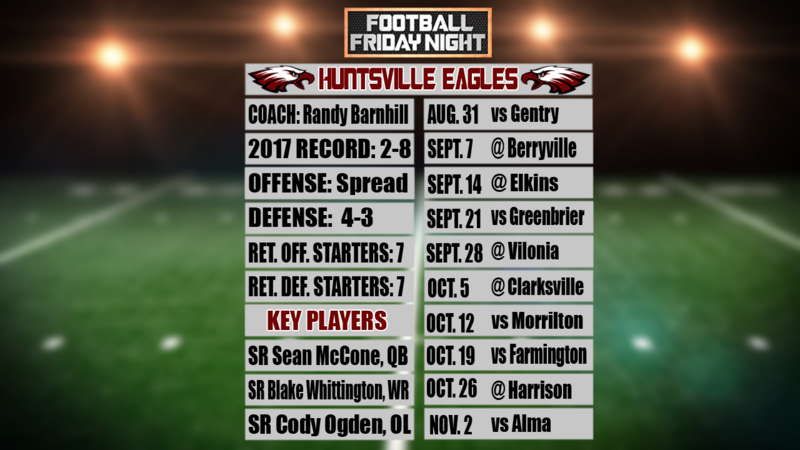 HUNTSVILLE (KFSM)–From a 2-8 season to stepping up a classification, the cards seem stacked against Huntsville this fall. That is, to everyone except the Eagles themselves. “I think it’s going to be challenging but not too much because we played a very tough schedule last year in the 4A,” quarterback Sean McCone said. “I think we’ll be able to compete and hold our own. “[McCone] threw for 1,800 yards and rushed for 500-600 yards so we’re expecting big things out of him as well as the rest of the our seniors,” Barnhill added. McCone, one of 14 starters back plays both ways for the Eagles, who once again play out of a spread offense and 4-3 defense. Huntsville faces Gentry at home to open the season on August 31, and hosts its first 5A-West game on September 21 against Greenbrier.